After celebrating International Women’s Day on March 8th, just a short time ago, this blog post feels extremely relevant. Before I start telling this story, let me set the scene for you: 3 women from 3 very different locations, thousands of miles apart, somehow find themselves all on the same page. And what is that page you might ask? Equality for women, a topic that we all hold extremely close to our hearts. Marta and I are very lucky to work within the Newport and Warsaw offices, where equality amongst genders comes naturally. However, this isn’t always the case for Maryam Aljishi. As a proud feminist and member of the Women Empowerment graduate project, she is fiercely fighting for equality within her office in Saudi Arabia. Marta and I both know that the position of women in Saudi Arabia is different than in our own countries, but it took us barely two sips of coffee that morning to find out why. Maryam was born and raised in Saudi Arabia. She went on to study a degree in Management Information Systems and graduated from university in 2017. She started her career working within the oil and gas industry for General Electric. 8 months into the job, Maryam felt unfulfilled and knew that this was not the path she wanted to continue down. Maryam’s passion and drive to pursue a career within the digital industry resulted in an internship at Microsoft, where she found the company to be very ‘pro-women’. While she had a fantastic time at General Electric and Microsoft, she explained, “they just were not the jobs I was looking for”. Maryam later applied for an account manager position at Dell. Just before her interview, a Starbucks employee shared with Maryam that “no women work in that office”. She didn’t let this scare her off. 6 months down the line, Maryam feels she has found her forever home at Dell Technologies. I asked Maryam if she had any reservations about joining a male dominated industry. “I definitely had, and still do have some worries” she explained, “I do question am I ever going to be good enough in their eyes, to climb the ladder and get myself a managerial role”. I truly believe this is something felt by many women, from many companies, across the globe. 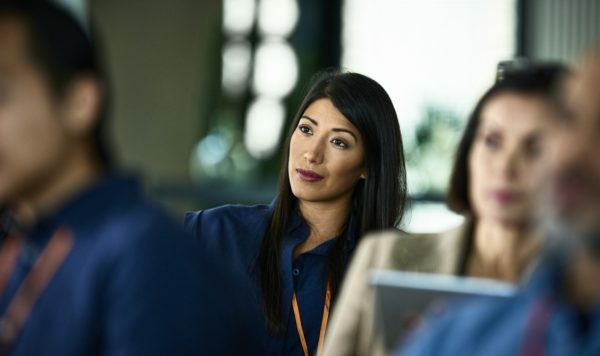 I know these worries have certainly crossed my mind, but I find comfort in seeing influential and powerful women in top decision-making roles at Dell, and might I add, doing a fantastic job of it. When Maryam first joined Dell, there were only 3 women in the office, and there weren’t activities or groups for them to socialize. One of the women had been working in the Saudi Arabia office for almost 9 years, but hardly ever spoke to anyone. “I just thought to myself, this is not healthy” Maryam openly shared. It was concerning to her that none of the women communicated—she wanted to help change this. Maryam initiated change by simply creating a WhatsApp group. 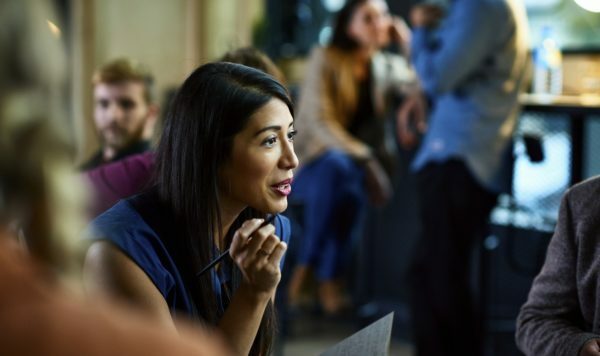 The chat gave her female colleagues a platform where they could communicate and connect with one another. It was a great way for them to meet and have lunch, allowing them to form friendships and stand as one united front. But Maryam did not want to stop there. 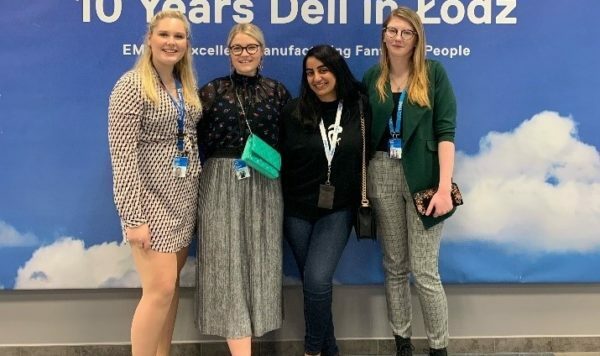 In her short time in Dell, she has worked alongside HR to create opportunities for female students through an internship program. There are currently 6 students who come into the office 4 times per week. Maryam told us that ‘they absolutely love it’. When asked if it is difficult to encourage young female students to be interested in IT, Maryam replied “most people have a very male dominated perception of IT, but moving forward, I would like to make sure that it’s something that appeals to both men and women”. This is something that resonated strongly with Marta and me. Growing up, I was always under the impression that IT was a man’s industry, but oh how my opinion has changed, and I’m very glad it has! Maryam is also working to get a ‘Women in Action’ organization set up in her office. She talked us through the process and how it has not been easy nor straight forward. However, it’s not just offices such as the Saudi Arabia one that doesn’t have such organizations in place. In fact, my own office doesn’t have a WIA organization set up due to our small size, but after speaking with Maryam, I definitely feel inspired to start one. “Men are not used to having women around them in the office. They don’t know how they should treat me and approach me and this can sometimes make things awkward” Maryam stated when asked about what it is like to be 1 out of the 7 women in the office. “You need to understand that we have different rules here. Women and men are not to allowed to share the same work environment. We aren’t supposed to work or sit together. I was one of the first ones to stop being so strict about it. It’s crazy when I think about it”. I remember feeling quite taken aback when Maryam told me of this law, as it’s something that I’ve never had to abide by. However, things are changing for the better. There is a feeling of freedom in the newly built city of Neom in Saudi Arabia. Men and women will be able to freely work amongst each other. This has given Maryam hope, as well as Marta and myself. Equality and change are happening. As we neared the end of our discussion I asked Maryam where she wants to go with the WIA organization. Maryam began “If I have the budget, I’d love to rent a place that holds around 30 to 40 people. I want to invite girls of all ages and help them understand what is possible for them to do. I want to show them the career opportunities and encourage them to network with each other. I mostly want to help people”. Maryam also hopes to invite more woman to the office, including students, leaders and managers of the organization. Creating an environment where females feel comfortable is her ultimate goal, and I truly believe she will achieve it. Just a mere week after speaking with Maryam, both Marta and I had the pleasure of meeting her face to face at the first graduate event in Lodz, Poland. She was exactly how I thought she would be, and her enthusiasm is inspiring. Maryam has this wonderful energy and friendliness that, pardon the cliché, makes you feel like you’ve known her for years. She is someone I would like to keep as a colleague, but most importantly, a friend for many years to come. When reflecting upon our discussion, I felt a number of emotions. As someone who was brought up in a society that encourages women to follow their dreams and pursue any career they wish for, I felt shocked and slightly saddened that this is not always the case for my female counterparts in different countries. I’ve come to realize and understand the importance of initiatives like Women in Action within our organization. It’s the people who make Dell Technologies thrive and develop. The future of IT is being driven by young and passionate graduates like Maryam, who are pushing for more inclusivity and equality. I feel very lucky to be a part of the graduate program where I have the opportunity to meet fellow graduates from across the globe who are so willing to share their stories and struggles. But most importantly, I feel inspired to fight for what I believe in and be more fearless, like Maryam. We all agreed that things will change with the spread of knowledge, but also with the surge of millennials entering the workplace. It may take months, maybe even years to see the first effects of our actions, but for the first time we can see it clearly on the horizon.